When Wendy Feinberg recalls meeting Alan D. Feinberg 21 years ago, she remembers not only the man, but also his car — a sharp Datsun 240-Z. From that encounter in the parking lot of a Sheepshead Bay diner came marriage, children and a life for Mr. Feinberg as both a firefighter and a Mr. Mom. Unbeknownst to his wife, Alan Feinberg, who worked at the time as a salesman of buttons and boys' clothes in the garment district, secretly wanted to be a firefighter. Four years into the marriage, that is what he became. To compensate for a cut in salary, Mr. Feinberg took advantage of the flexible hours of firefighting to remain home with Tara, now 18, and Michael, 15, while Wendy took the 6:05 a.m. into the city to work as a broker at Cantor Fitzgerald, a job she left in 1996. 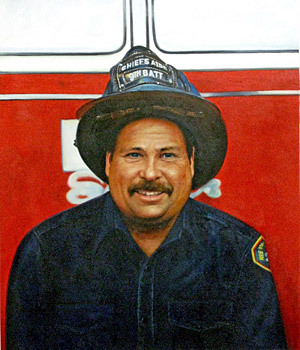 His children remember Firefighter Feinberg, 48, making breakfast, putting them on the school bus and being the "class dad" who chaperoned school field trips and coached baseball and soccer. As his children got older, Firefighter Feinberg, who was the battalion chief aide at Engine Company 54 in Manhattan, took on a second job that built on his love of fancy cars: he became a transporter of new cars to the automotive press, which would then write about them. Just recently, he was thrilled to have dropped off a PT Cruiser and a red 2002 Corvette. "He would have loved that new Thunderbird if he had seen it," his wife said. "He was doing what he wanted to do," she added. "He was very happy. Everyone should have had such a happy life. He was the little boy who never grew up." Profile published in THE NEW YORK TIMES on December 22, 2001.